It’s a cliche nowadays to say that horror stories that become popular reflect the “zeitgeist of the times”. Giant monsters roam around due to radiation? We’re afraid of nuclear bombs. Space aliens secretly infiltrate a town? Communists are endangering our children! The current rage is zombies – faceless hordes wanting nothing more than to eat our flesh and turn us into one of them. Movies and TV shows starring either slow or fast hordes of zombies running amok in the world are everywhere. As popular culture has become saturated with variations of the basic zombie plot – plucky survivors run from the zombies – storytellers have been branching out to find different angles with which to approach the topic. 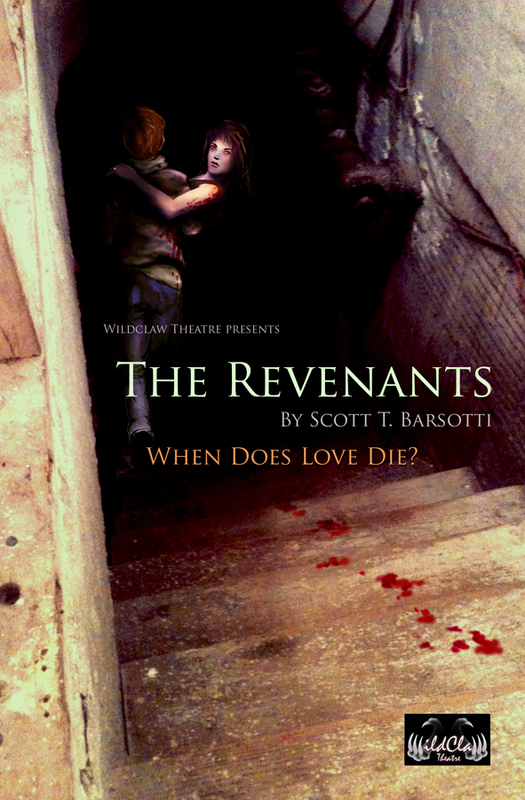 In The Revenants, Scott Barsotti has found an interesting angle on the zombie story. The plot is relatively simple. Gary (Josh Zagoren) and Karen (Elizabeth Birnkrant) are two friends who are hiding out from a zombie invasion in the basement of a house. Their spouses, Molly (Krista D’Agostino) and Joe (Drew Johnson) had been infected right before they found the hideout, so we get a tiny taste of their human personalities before they turn completely. Instead of running away and leaving them behind, Gary and Karen keep their spouses tied to the basement wall after they “wake up” as full-fledged zombies. Karen has a particularly tough time believing that her husband is gone. She thinks the real him is just buried deep in his mind. If she can say the right thing she might just be able to get Joe to resurface and return to her. Gary has taken a more pragmatic approach – he is focused on survival above all. When Gary and Karen return after a supply run, we find out Karen had insisted on going to her house – not for supplies, but for mementos. She brought a locked tote bag back to the basement. Only Joe knows the combination to the lock. She thinks that if she shows Joe the bag and badgers him enough to open the lock, it would prove her husband is not lost forever. When Gary makes another trip out for supplies, Karen spends her night alone trying to reach Joe. The situation begins to go awry. Who doesn’t enjoy a little mastication in the evening? Most zombie stories focus on survivors like Gary and Karen. TerrorDave Fuentes and I attended a Rifftrax Live show last year of the original B&W Night of the Living Dead. That movie established the original template for a zombie story. It focuses on a small band of survivors trying different ways to battle against the crowd of zombies outside the house. This trope has become so ingrained in today’s culture that it’s become a punchline. Doing a quick search on Amazon for books on surviving a zombie apocalypse brings up quite the list of titles. One of my favorite Mythbusters’ episodes of the past year was when they tested which would be a better choice of weapon – a gun or an ax – against endless hordes of zombies (spoiler alert, neither worked that well). But beyond the jokes, what is the reality of losing your loved ones to a zombie virus? Because of our cultural conditioning in a way it is frustrating to hear Karen constantly rattle on about Joe; he’s a zombie, shoot him in the head! But he’s not really a danger to them. He and Molly are tied to the wall, and they aren’t trying that hard to get to Gary and Karen. There is more immediate danger from discovery by the zombies roaming the town than the two in the basement. I think Karen portrays a more realistic reaction to seeing a loved one succumb to a deadly virus. Joe is still standing and reacting to stimuli – she feels if she just tries hard enough, he can overcome his problem and reemerge. Who among us wouldn’t want to at least try to get our loved one back rather than just blasting away at them? 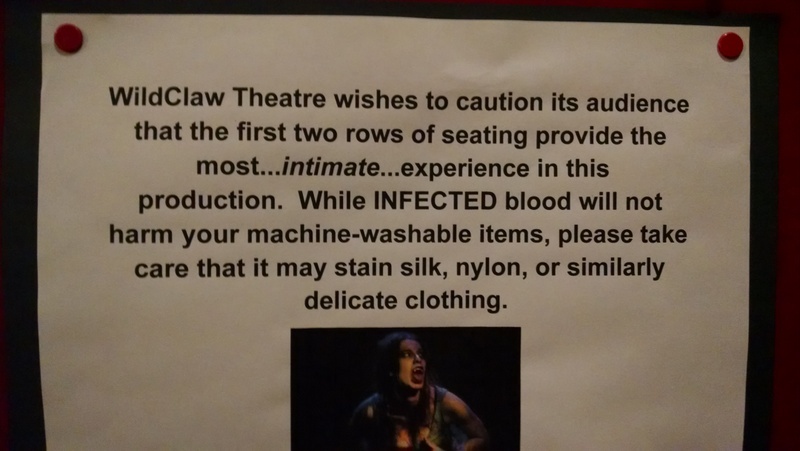 There are two warnings for this play – it must be good! 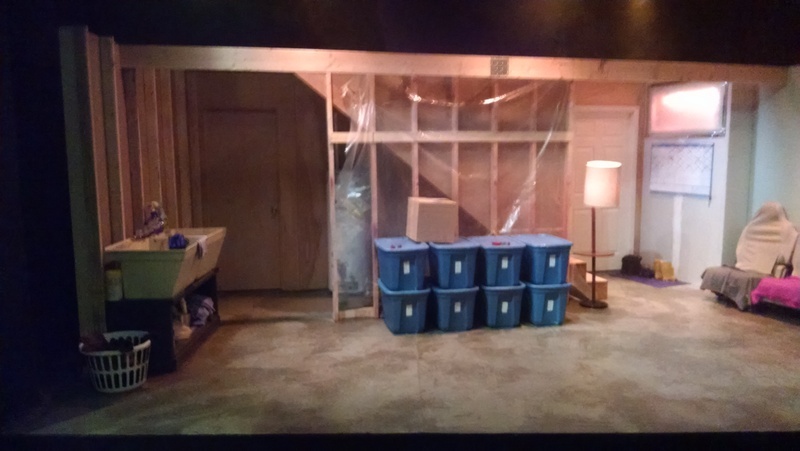 The play takes place in one act, on one set. Joe and Molly moan, groan, and grunt throughout the entire play. It emphasizes how trapped Gary and Karen feel – and we feel trapped with them. Krista D’Agostino and Drew Johnson had a really tough job. They spent the entirety of the play (except for one brief, disconcerting moment) moaning and grunting, yet they still manage to portray a character arc. They begin the play extremely passive, slowly morphing into more aggressive behaviour. It would be interesting to see the script and what kind of direction was given for those characters! Josh Zagoren plays Gary as the more familiar zombie apocalypse survivor. He is focused on getting supplies, keeping a gun handy in case they lose control of Molly and Joe, and trying to figure out what they are going to do next. It is a delicate balance because he is constantly in opposition to Elizabeth Birnkrant’s Karen. Birnkrant has the thankless task of being the more realistic, human character. Because of our society’s obsession with survival at all costs – that we would be the lone cowboy wandering the countryside blasting away without remorse – it’s tough to sympathize with someone who is reluctant to take out her zombie spouse. 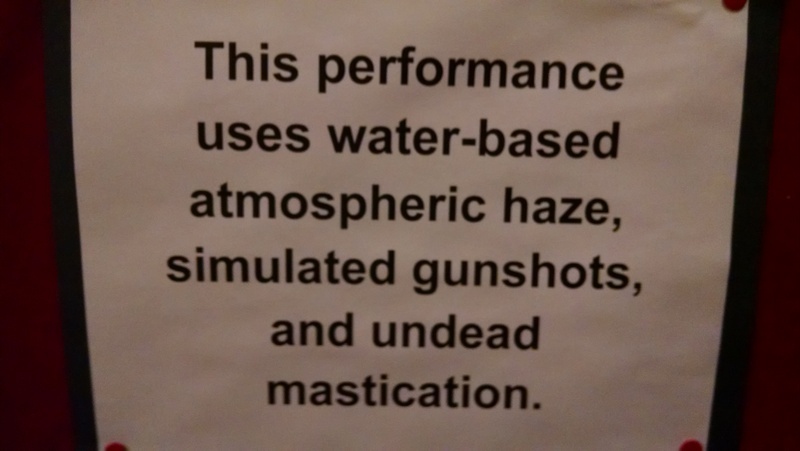 If you are looking for a different perspective on a zombie invasion, catch a performance of The Revenants – and think about what you would do it if was your loved one suffering from a zombie virus. Could you take the head shot? This entry was posted in Horror Theatre and tagged Review, WILDCLAW THEATRE. Bookmark the permalink. ← Top FIVE Vampire movies for Valentine’s Day! Not your usual zombie story… I’m still thinking about the play, going through the “what would I do in that situation” musing. For some reason, horror movies are my filter for introspection and self-examination. So many parallels to real life. Watching a loved one succumb to eventually death from drug addiction and mental illness, still seeing the person he was years ago struggling to break free of the curse. My mother’s death four weeks ago, her being ready to die but her body not quite there yet, and her begging us to find a way to hurry up the process… Many deep thoughts. Perhaps horror stories provide a buffer for dealing with what otherwise would be unendurable. Definitely a play worth seeing–passionate characters, evolving relationships and, who knows? You might learn something about yourself too.